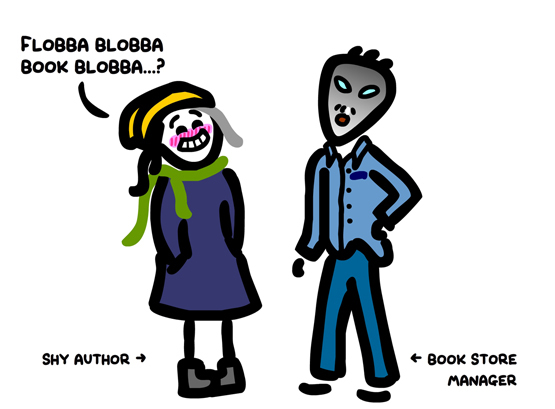 Self-publishing can be full of drama. 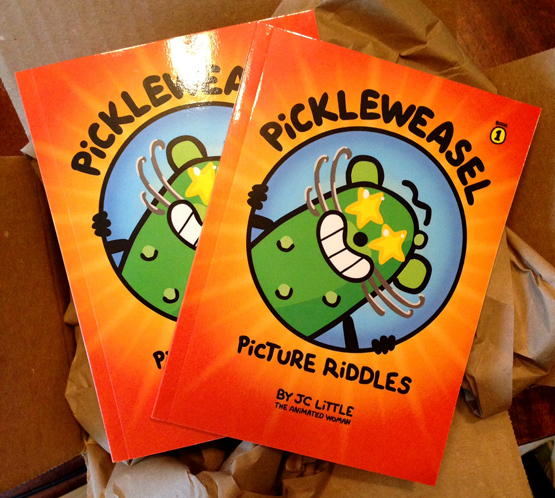 Earlier this week I submitted my book, PickleWeasel Picture Riddles, to Amazon's CreateSpace for review. They approved it and I ordered my proofs. And then...I decided to make a teeny, tiny change to the interior file: I added page numbers to the bottom of each page and then resubmitted the book for review. For those who do not know it, CreateSpace is Amazon's 'print-on-demand' company. 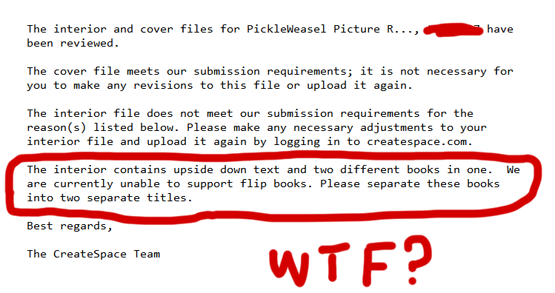 In this email they are telling me they won't approve my book interior (after already approving it). Because the answers are upside down. And because it's two books in one. Or something. To be honest, I can't even "can't even" that one. GUYS. 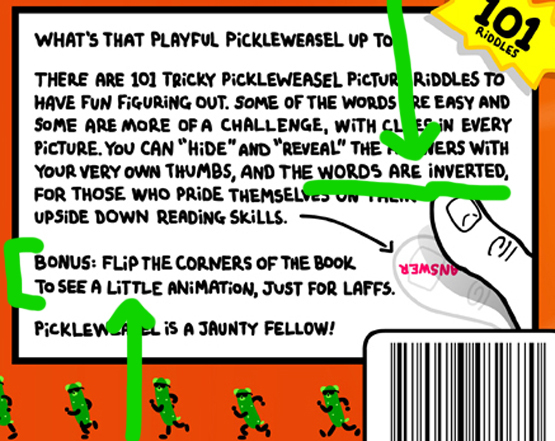 IT'S A RIDDLE BOOK. The answers are supposed to be upside down. 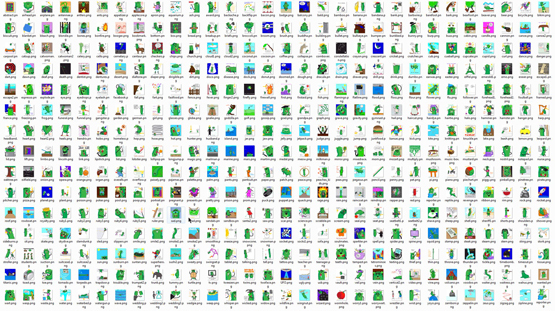 Also there's bonus flippable animation in the top right corner because it's fun for kids. All this is written on the back cover and in the book description. You know those violins in the shower scene in Psycho? I had those in my soul. 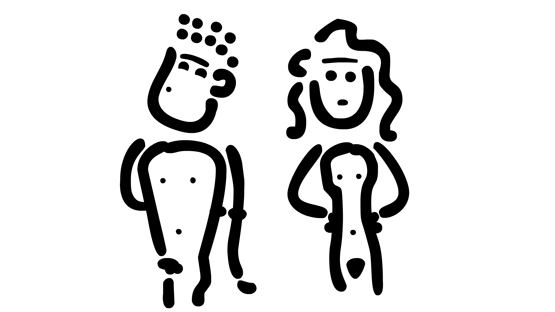 I called up CreateSpace and explained everything to a patient and polite person named "Anthony". Anthony insisted that an actual human person does look over each and every book. When I asked why it was first approved and then not, he said that one person notices things that another person doesn't. Me: "So it's a subjective process then?" Anthony: "Uh....it's not supposed to be. But it happens." He promised to resubmit it for me, and to plead my case. He said it would take about two business days. I did warn him that I have a small but feisty social media army on my side. Ashley is also very polite. They are so pretty I want to sleep with them under my pillow. I guess these should be ready to go on sale anytime...maybe I should wait until after Thanksgiving. Have you guys started your Christmas shopping yet? 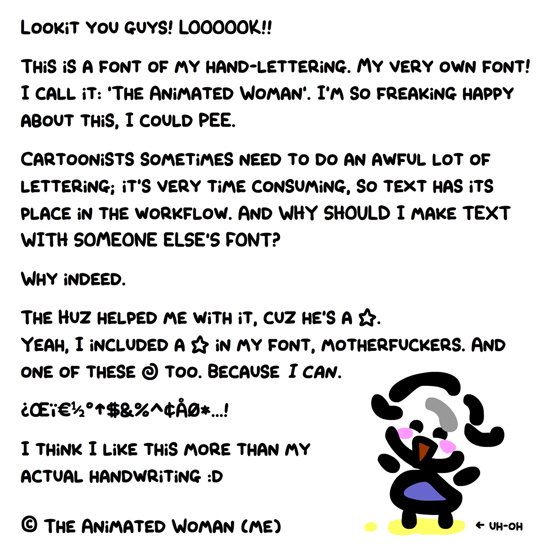 For a long time, The Huz has been trying to convince me to make a font. I just never had time. I still don't have time. 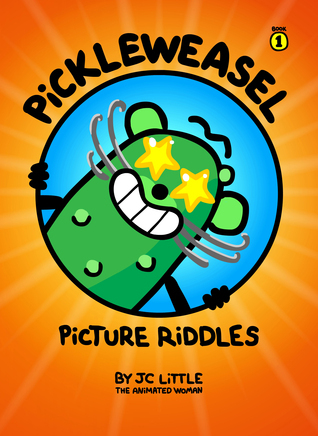 But I'm building the Kindle version of PickleWeasel Picture Riddles (book 1) and I want it to have popups - super fun, right? But the popups are text based. 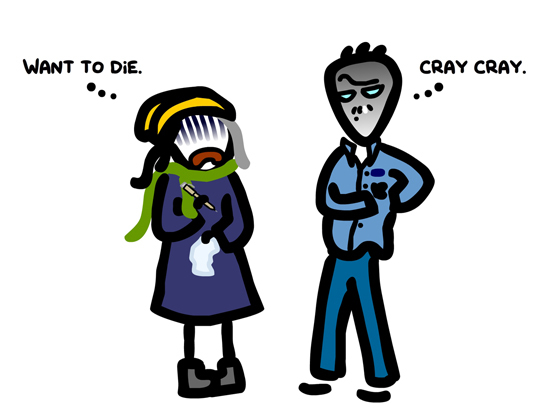 So it became an unavoidable necessity. How to make a font? 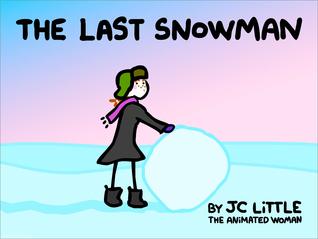 It was a bit of a hack getting this font made; the look of my line comes from a certain blobbiness in Flash. I've tried to reproduce it in other apps and programs and it's never quite right. But to get from Flash to the FontLab meant jumping through several hoops including backwards saving from Flash CS5 to CS4 to CS3, going from W7 to MAC to XP on different machines. Then output to Illustrator and finally to Eps, which could be imported into FontLab. And speaking of time, this font is going to save me tons. Thanks to The Huz! I've been frightfully busy getting my next four books lined up. Yup, you heard right: FOUR books. For kids. 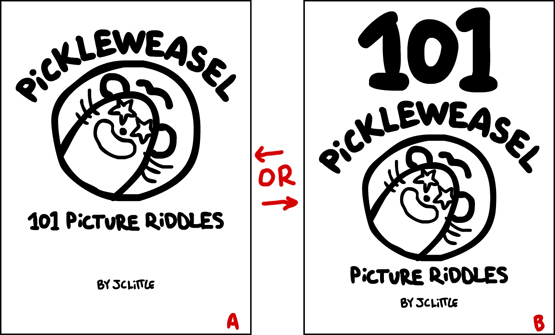 Because I somehow ended up with several hundred drawings of PickleWeasel. 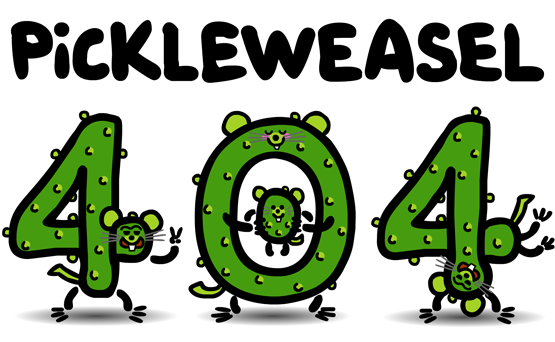 101 PickleWeasels! 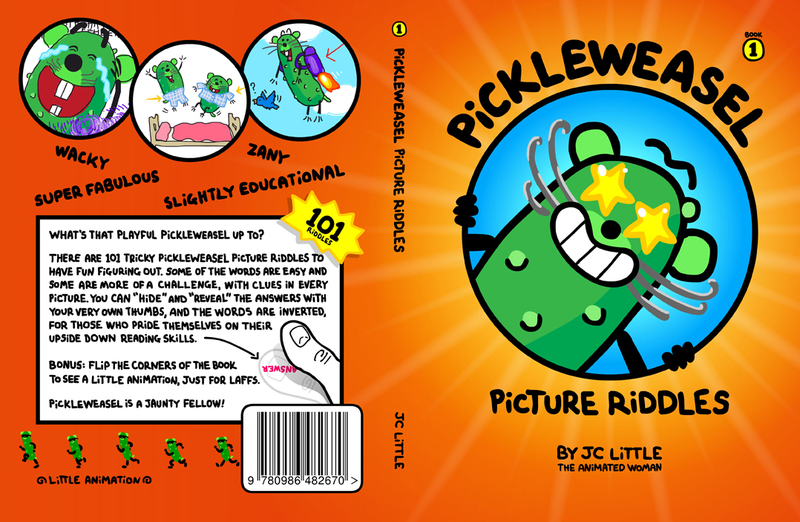 (working title) are comin' atcha in the first book in just a few short weeks. 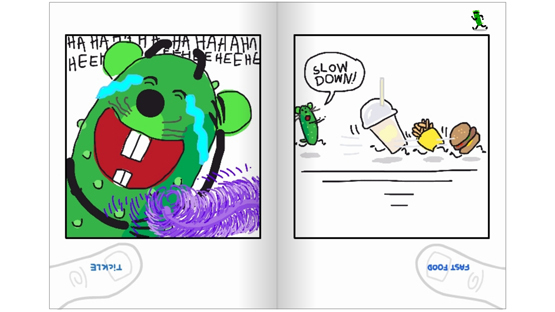 Print and Kindle versions. In time for Christmas and gifts and stuff. The rest of the series will follow over the next year, so you can collect the whole set, just like a proper book series. I am smart. As usual, PickleWeasel is acting out, and you have to guess what he, she, they are up to. 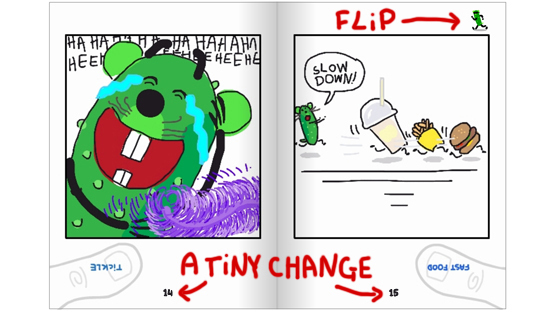 Some of the words are easy and some are a little more challenging (even I learned a few new words making this book) with the option to "hide" and "reveal" the answers with your very own thumbs. Plus the answers are upside down, since I know that some of your kids pride themselves on upside down reading skills. 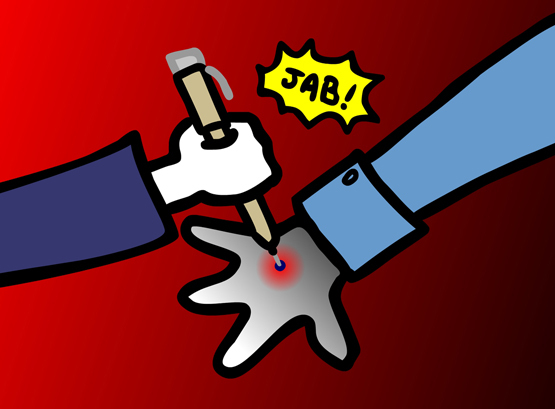 And just because I can, I put this flippable animation in the corner. Swaaag! 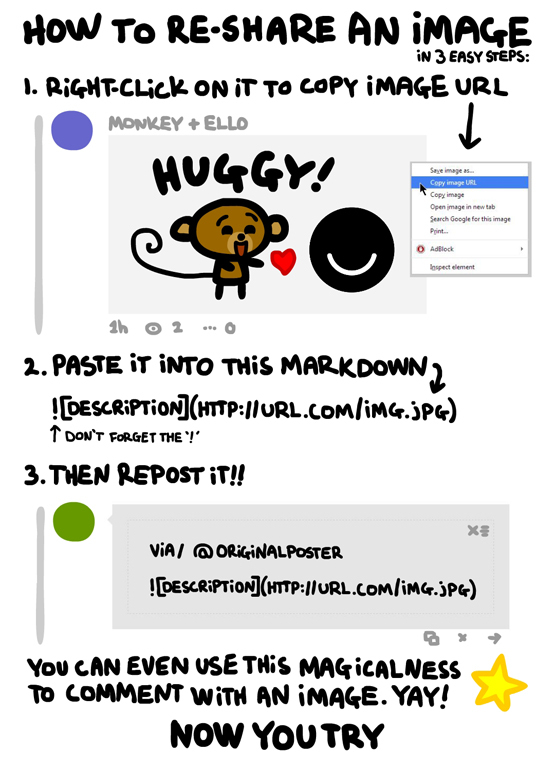 I didn't think people were going to find this so useful, as I posted it about a month ago on Ello. One of my favourite things in life is to comment on social media with an image, and also, to share someone else's image. Since Ello is still in beta, there's no function yet to make this happen. image from your drive. I upload my images through my Blogger account; it's important not to abuse the hosting of other sites when using this code.